Complete with diagrams, graphic organizers, classroom examples, assessment tools, and lists of core understandings, Pulling Together presents a comprehensive answer to the current big ideas in teaching—formative assessment, backward design, inquiry learning, strategic teaching, metacognition. The authors show how this collaborative process is reflected in all aspects of the literacy learning, from unit planning and lesson sequences, through the inquiry process and gradual release of responsibility in the classroom, to linking formative and summative assessment for responsive planning. 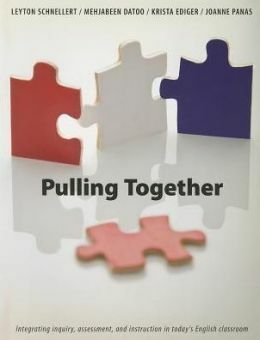 For a review of Pulling together, click here. Listen as Mehjabeen Datoo and Leyton Schnellert discuss their latest book, Pulling Together, and how teachers can use as few as three units during a school year while using diverse texts to engage students, differentiate, and build confidence.